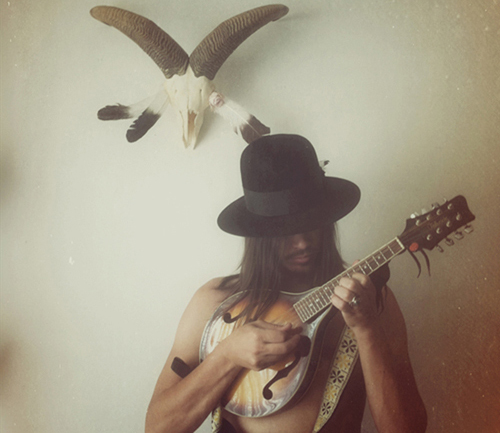 Mesquite Treason embodies Avant-Americana. It is a performance bordering on witchcraft, utilizing theatre multimedia and a collection of bizarre prepared instruments and life sized electronic controllers, Blanton Ross is a scientist conjuring western lore, cowboys and indians, boomtowns and empty prairie, woven into a blanket of alien noise interference and sonic manipulations of acoustic instruments. Mesquite Treason is tribal and folk, a mixture of the many ethnic threads that first laid claim to The New World. Existing somewhere between European and Native it trespasses on the fringe like lonesome mountain men, vikings, braves, and outlaws. It rises against that tendril of industry cutting through untouched land, bending it to the will of agressive man knowing we must be that industry to stand a chance. With nostalgia and modernism it seeks to redirect the evolution of a broken system by reminding us where we went awry, reminding us that returning to harmony may be the only way forward. Hinting at a perhaps unavoidable violence that might be forced to break a blind wheel. Idealist in naturalism, preserving the legacy of The West founded by the original pioneering spirits pushing forward into tomorrow. Mesquite Treason unavoidably sides with Native America, Remembering forever the cruelty they faced. Remember Sand Creek. May we cross sacred arrows of the Cheyenne and release a most powerful medicine. Here is past overlapped by present, echoes of Navajo nation radio stations falling in and out of range while traveling through our nations vast empty places. We live in the static here, Each who stands alone is Native now, facing a mighty hand of oppression and a flood of conformity. It is our nature to seek asylum from the onslaught, to turn our face from the overrun homeland and run ever towards something new. Though it is contrary to our nature, individuality must gather and face this wave with full force of unity. By this we will rise. By this we can claim the future and venture out to find new undiscovered places, places that remain free only as long as we remain one step beyond the grasp of the machine.